Overall Impression: This is the fourth play of the first tetralogy. It gives a fascinating depiction of an evil man, is well written and has some great lines, though seeming a little crude and lacking in subtlety compared to later WS. Overview of the Historical Plays: See Henry VI Part 1, especially on royal genealogy. Per Bevington: The chief sources are Edward Hall's "The Union of the Two Noble and Illustre Families of Lancaster and York" and probably Raphael Holinshed's "The Chronicles of England, Scotland, and Ireland, 2nd Ed." These drew their negative and hostile portrayals of Richard III from Polydore Vergil's "Anglica Historia" (1534, argues that England's suffering was a divinely sent scourge to prepare them for Tudor rule) and Thomas More's "The History of King Richard III" (left unfinished in 1513, drew in turn on Cardinal Morton, the Bishop of Ely named in the play). Possibly also drew on: (1) Fabyan (1516), (2) Stow's "Annals" (1580, 1592), (3) "A Mirror for Magistrates" (1559, 1563), and (IV) the anonymous "The True Tragedy of Richard III" (c. 1590-1592). The single character Richard III dominates this play, unlike in the earlier plays of this tetralogy. His career is part of a larger order, a seemingly providential plan of retribution for wickedness and injustice and for reconciling England's divisions. The action, though often compressed, covers the time period from 1471 (King Henry VI's funeral) to the Battle of Bosworth (1485). Principal themes/events include: The wooing of Lady Anne, The correspondence between outer appearance and inner qualities; Richard as the scourge of God; his "motiveless malignity" like Iago; Richmond as God's minister, chosen to destroy the scourge and deliver England from its sin (Providential destiny); the insecurity of tyrants; the role of prophecies and dreams. London, near the Tower of London. Richard, Duke of Gloucester ("Richard", future Richard III or "R3"), son of Richard Plantagenet Duke of York, is the youngest brother to Edward IV ("E4"). E4 is newly declared king since the murder (by Richard) of King Henry VI ["H6", see 3H6 5.6]. Alone, Richard muses about his brother's rise to the throne and lascivious life, his own deformity, and his planned treachery. He has arranged to have E4 suspect their brother George Duke of Clarence ("Clarence") of plotting against E4 (hoping to eliminate one of the many persons standing in Richard's way of attaining the throne). Clarence is brought by under guard, led by Sir Robert Brackenbury, and laments to Richard the prophecy E4 has learned suggesting someone with the letter G will cause Edward's children to be disinherited. Richard acts sympathetic and suggests to Clarence that the person actually responsible is Lady Elizabeth Grey, the widow newly wed to E4 and now termed Queen Elizabeth ("QE"). He claims that she and her brother Anthony Woodville (Lord or Earl Rivers, "Rivers") are responsible for sending the Lord Chamberlain William Lord Hastings ("Hastings") to be imprisoned in the Tower. Richard promises to deliver Clarence from his imprisonment, though he actually is planning to have him murdered. Hastings appears, having been released from the Tower after appealing to the king's mistress Mistress Shore [she is his future mistress], and indicates to Richard his intention of getting back at those responsible for his imprisonment. The king is sick from an overindulgent lifestyle. Alone, Richard muses that E4 must outlive Clarence. He also ponders his strategy to woo the widow Anne, daughter of the Earl of Warwick and previously married to the son of King Henry VI and Queen Margaret ("QM"), Edward Prince of Wales (he was murdered 3 months ago by E4, Clarence and Richard in front of Queen Margaret, see 3H6 5.5). London street. The body of H6 is being borne in a funeral procession [historically 1471] from St. Paul's to Chertsey monastery and is accompanied by Anne. To herself, she curses Richard, his future wife, and his future offspring for the murders of H6 and her husband. Richard arrives and boldly has the procession halt so he can talk to her, threatening the armed halberdiers who try to block him. The corpse begins to bleed again in the presence of the murderer. Though he initially denies the murder of her husband, he eventually takes the position that he did the murders out of love for her, and wants to lie with her. Gradually he pursues his audacious suit, overcomes her revulsion, and wins her over to him [historically he wooed her in 1472]. At one point he challenges her to stab him to avenge the murders, but she cannot do this, and is brought under his power as a result. He places a ring on her finger and asks to meet with her later at Crosby House, one of his homes. The corpse is taken to Whitefriars (a Carmelite monastery). Alone, Richard cynically marvels "Was ever woman in this humor wooed?" and plans to keep her only for a short while. The Royal Court. QE meets with her brother Rivers, and her sons by her first marriage Lord Grey and the Marquess of Dorset ("Dorset"). She laments E4's declining health and her fate should he die, considering her lack of trust in Richard, who has been named to be Protector of her children. The Duke of Buckingham ("Buckingham") and Lord Thomas Stanley Earl of Derby ("Stanley") arrive. The latter is married to Margaret Beaufort (Countess Richmond), widowed from previous husbands (1) Edmund Tudor Earl of Richmond, the father of Henry Tudor Earl of Richmond (future Henry VII, "Richmond") and (2) Lord Henry Stafford. Buckingham informs them that E4 wishes to see them to effect an atonement between Richard and the Queen's family as well as between Hastings and them. Richard storms angrily in and complains that QE and her family members have told E4 that he dislikes them--he insists that his lack of courtly flattery etc. should not be taken for enmity, but QE recognizes that he envies their advancement. Richard accuses them of causing the imprisonment of Hastings. H6's widow, Queen Margaret [who historically was in permanent exile in France at this time] enters and lurks in the wings, commenting to herself about the confrontation taking place. Richard reminds Rivers that River's family (e.g., Sir John Grey, QE's first husband) fought with the Lancastrians in the War of the Roses, not on the Yorkist side. Richard denies any interest in the throne himself. Queen Margaret advances and lambasts them all. Richard reminds her of the cruel slaying of his young brother Rutland [by Clifford 3H6 1.3] and of his father the Duke of York [by Clifford and Queen Margaret 3H6 1.4], and of the curse York had laid on Margaret as a result. QM compares the degree of these offenses with QE and insists her grievance and loss is greater. She lays curses on: (1) E4, who will die of surfeit; (2) QE's son Edward Prince of Wales (the future Edward V, "E5"), who will die in his youth of violence; (3) QE, who will outlive her glory and be wretched wailing her children's deaths [ultimately her 2 sons but not her daughter Elizabeth of York, who will survive to marry H7]; (4) Rivers, Dorset, and Hastings, who will be cut off prematurely (because they were standing by when her son Edward was slain); and (5) Richard, who will receive a plague of sins. She claims QE will some day also curse Richard and praises Buckingham, warning him about Richard, saying that he will split his heart with sorrow. After she leaves, Richard claims to repent the wrongs he has done to her. Sir William Catesby, one of Richard's henchmen, calls them to the king and only Richard remains. 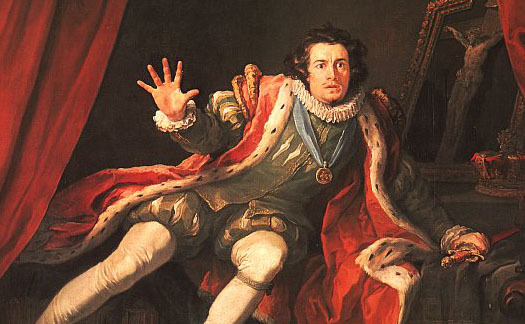 His plan is to convince Stanley, Hastings, and Buckingham that the Queen and her relations have stirred up the King against Clarence, to seek revenge on her family. Two Murderers he has hired to kill Clarence appear--he gives them a warrant that apparently E4 has approved of. Richard warns them not to listen to Clarence's pleadings. The Tower. [Historically 1478] Clarence talks with the keeper. Clarence divulges his terrifying dreams of Richard accidentally causing him to be drowned in the sea. While under water, he had visions of shipwrecks, corpses, jewels in their eye sockets, etc. He journeyed across the Styx to Hades where he encountered the shades of: his father-in-law Warwick (who condemns him for changing sides during the war [from H6 to the Yorkist side]) and H6's son Edward Prince of Wales, whom he stabbed at Tewkesbury. He fears for the lives of his wife (the former Isabell Neville) and his children, Edward and Margaret. The lieutenant of the Tower, Sir Robert Brackenbury enters while Clarence sleeps and muses on the superficial nature of the glories and titles of princes. The murderers arrive and are allowed to enter on the basis of the written warrant--Brackenbury does not wish to know what they are up to. The Murderers wrestle with their consciences while Clarence sleeps. He awakens and they talk extensively. At last they inform Clarence that it is in fact the deceiving Richard who has sent them. The first murderer finally kills him despite his pleas, the second murderer regretting his participation in this plot. London, The royal court. E4 enters, sick, along with QE, Dorset, Lord Grey, Rivers, Hastings etc. E4 insists that Rivers and the Queen's other family members reconcile with Hastings and shake hands--they all pledge to be loving and harmonious. Also Buckingham embraces the queen and pledges his support. Richard arrives happily, agrees cheerfully also to the reconciliation, then casually mentions that Clarence is dead, implying that the Queen is insensitive to mock Clarence as though he were still alive. E4 is aghast to learn that his order to reverse the prior request for murder was not acted on in time. Stanley arrives and insists on being heard regarding his petition to spare the life of his servant, who has killed a gentleman. E4 is bitter about this request, given his responsibility for Clarence's murder, and laments that no one pleaded for Clarence's life. He recounts how they fought together during the war, how Clarence rescued him repeatedly. Later, Richard hints to Buckingham how the Queen's family looked guilty at the news of Clarence's death [though in fact they are innocent]. London, The royal court. The old Duchess of York [Cecily Neville, widow of Richard's father Richard Plantagenet Duke of York] enters with Clarence's children. The boy asks if his father is dead, and blames his uncle E4 for it. The boy understands from Richard that it was the Queen's doing, and that Richard has shown kindness to him. But the Duchess is not deceived by the unscrupulous Richard and views him as evil, a "false glass". QE enters in disarray--E4 has died [historically 1483]. The Duchess and QE enter into an extensive comparison as to which has the greater cause for grief. The children are unsympathetic for QE, since she did not weep for their father Clarence's death. Rivers counsels QE to have her son Prince Edward E5 crowned as king. Richard and Buckingham arrive. Richard wants to send a small contingent to fetch E5 from Ludlow in Shropshire, to which Rivers acquiesces after questioning why this contingent should be so small. Buckingham and Richard are conspiring to separate QE's relatives from the Prince Edward E5, and plan to go themselves to Ludlow. A street in London. Three citizens discuss the king's death and predict trouble ahead. London, The Royal Court. QE, the old Duchess of York, and E4's child Richard Duke of York ("York", brother of E5) enter. They are anxious about the progress reports regarding the journey of E5 et al. York recounts ominous comments Richard has made about fast growing weeds (i.e., York). The Duchess recounts her grim recollections of her deformed and stunted son in his childhood. York says he has heard that Richard was born already having teeth, but is shushed up. A messenger arrives with the news that Rivers, Lord Grey, and Sir Thomas Vaughan, who were traveling with E5, have been arrested and transported to Pomfret (Pontefract castle in Yorkshire). QE sees the ominous implications and decides to flee with her son, York, to sanctuary [at Westminster Abbey]. The Archbishop of York agrees to take her there. London street. E5 arrives and is welcomed by Buckingham, Richard, and others. E5 wishes to see more uncles, but Richard tells him they were all false uncles, which E5 denies. The Lord Mayor and Hastings come, the latter advising that the queen with her son York has sought sanctuary. Buckingham persuades the Lord Cardinal Bourchier Archbishop of Canterbury to break the rules of sanctuary and fetch York, claiming that children are not entitled to it. Richard tells E5 that he and his brother will be kept in the Tower. E5 asks Richard about the history of the Tower, that Julius Caesar built it. The Cardinal returns with young York and Hastings. York toys and puns saucily with Richard, asks for his dagger, talks about riding on his back like an ape would upon a bear. Buckingham marvels at the biting wit of young York. York does not wish to sleep in the tower, fearing Clarence's ghost, but agrees finally. Alone, Richard and Buckingham plot their further strategy following the coronation of E5. Buckingham asks Catesby to sound out Hastings regarding their intended purpose to kill the Queen's relatives at Pomfret. They will also kill Hastings if he seems unenthusiastic. Before Hasting's house. A messenger arrives to inform Hastings that Stanley has dreamed of a boar attack [the boar signifying Richard as depicted on his crest], warns him of two councils taking place that night, and asks if he wishes to flee with him to the north. But Hastings is confident the dreams are unfounded and that Richard will treat him kindly. Catesby arrives and sounds out Hastings on Richard's eventually winning the crown. Hastings is violently opposed to this and refuses to support any plan to change the succession from E4's heirs. Catesby knows to himself that Hastings will himself die for not supporting Richard's bid. Stanley arrives, still worried about the multiple councils, and Hastings again refuses to listen to Stanley's wise concerns regarding their lives [apparently Stanley is finally persuaded not to flee]. Hastings is pleased that the Queen's relations are to be put to death. He speaks to a priest just as Buckingham walks in--B. is going to the Tower and asks Hastings to join him. Pomfret Castle. Sir Richard Ratcliffe with guards talks with the prisoners, QE's relations. The doomed men recall that Richard II died there and that Queen Margaret's curse is coming true for them. Rivers hopes that their blood will suffice and that QE's sons will not also be killed. Ratcliffe leads them to their deaths. The Tower. The Bishop of Ely (John Morton), Hastings, Buckingham, Stanley, and others meet to determine the date of the coronation of E5. They ask Buckingham what Richard (now Lord Protector of E5) would prefer--he replies that he does not know Richard's mind, only his face. Richard arrives and sends Ely for strawberries. Richard privately informs Buckingham of Hasting's refusal to support their plan to take the crown from E5, then they leave. Hastings is satisfied that Richard seems pleased with the proceedings. But Richard and Buckingham reenter. Richard [as a pretense to prove Hasting's disloyalty] accuses QE and E4's mistress of using witchcraft to wither his arm. Hastings is skeptical, and Richard calls him a traitor and demands he be beheaded. Lovell and Ratcliffe take Hastings away as he laments that QM's curse on him is also coming true. He prophecies a fearful time to come for Richard. The Tower. Richard and Buckingham are in rusty armor and discuss their ability to act or play a part well. [They seem to be pretending to be under attack.] The Lord Mayor arrives, then Lovell and Ratcliffe with Hastings' head. Richard "weeps" for the loss of his allegedly traitorous friend and B. joins in to convince the Mayor of Hastings' guilt, claiming that Hastings had plotted their deaths during the Council House meeting. They express regret that the Mayor has not heard the treasonous statements from Hastings himself, and the Mayor docilely agrees to inform the populace that the execution was justified. Richard then instructs B. to go to the Guildhall, and imply that E4 was himself conceived when his father was away, and that furthermore the sons of E4 were illegitimate (see below), etc., in order to stir up support for Richard. In the meantime Richard is going to surround himself with pious men of religion, Doctor Shaw and Friar Penker. A street in London. A Scrivener reads the indictment against Hastings but recognizes that it is a sham. Courtyard at Baynard's Castle (Richard's residence). B. says to Richard that the citizens received the news about E4's bastardy, etc. in silence and fear. The Mayor attributed these statements to Richard (not to his own knowledge) and the reception was lukewarm. B. further coaches Richard in assuming religious wrappings. The Mayor arrives with townspeople. Richard is seen to be in devotions with the two reverend fathers and a prayer book in his hands--B. praises his piety to the citizens. B. entreats Richard to interrupt his devotions to meet with them. B. publicly tries to persuade Richard to accept the crown, appealing to his nobility, but he feigns reluctance and modesty initially, commenting also that there are royal offspring ahead of him. B. says the children are bastards, since E4 had initially been betrothed to Lady Lucy and also to Lady Bona and his subsequent marriage to Lady Grey was bigamous. The Mayor joins in the entreaties, B. says E5 will never reign, and finally Richard acquiesces to accept the crown. The coronation will take place the following day. London, before the Tower. The Duchess, QE, the Marquess of Dorset (Dorset's wife), Anne, and Clarence's daughter Margaret meet. Lieutenant Brackenbury refuses the women's request to see the young princes being held, even their mother, on orders of the new "King". Stanley enters and tells Anne she is to be crowned as Queen. QE is enraged at this news and tells Dorset to flee the death and destruction that will follow--he should go to Richmond in France. The Duchess laments her evil son Richard whom she gave birth to. Anne is reluctant to play her role as Queen, and the other women do not envy her. She recalls with displeasure how she was wooed by Richard and indicates she has never had a sound night sleep while married to him, fearing now for her own life. The Duchess bids Dorset go away to Richmond, Anne to Richard, QE back to sanctuary, and herself to the grave. QE laments her imprisoned children. The royal court. King Richard asks Buckingham for his approval of his plan to kill the children of QE. B. asks for time to think, and Richard decides abruptly to himself that B. is no longer a firm supporter. He resolves to have him killed, hiring Tyrrel to arrange this. Stanley arrives to inform Richard that Dorset has fled to Richmond. Richmond instructs Catesby to spread a rumor that Anne is very sick. He also also wants a fool of a man to marry Clarence's daughter Margaret to (the other child of Clarence, Edward, is simple and no threat). He resolves he must be married to E4's daughter, Elizabeth of York. Tyrrel arrives and he instructs him in killing the children, E5 and York. B. comes back, and asks to claim the earldom of Hereford as his due for faithful service. Richard ignores him initially, being preoccupied with concern about Richmond. He wonders to himself why he overlooked having Richmond killed, recalling a prophecy that he will not live long after seeing Richmond. Finally he refuses B. 's request, leaving B. bitter and resigned to flee for his life, knowing he is now in disfavor. The royal court. Tyrrel informs Richard that the children have been smothered by Dighton and Forrest and buried. Richard has now taken care of all the children standing in his way, except for Elizabeth, and Anne is dead. Ratcliffe informs him that Morton (Bishop of Ely) has fled to Richmond, and B. is raising an army in the field, backed by Welshmen. Richard resolves to take swift and decisive action against them. Near the royal court. Queen Margaret, pleased with the destruction she sees taking place, resolves to go at last to France. QE and the Duchess meet and lament their terrible losses, comparing and competing in the degree of their suffering, while QM listens with satisfaction at their misery. QM then comes forward and joins in the talk of grief and losses. She longs to see the day when she can declare of Richard, "The dog is dead" and they all review the catalog of Margaret's curses that have come true. QE asks her to instruct her in making curses, but QM leaves without doing so, saying simply that her woes will make her curses sharp and piercing. Richard's procession comes by. The Duchess his mother wishes she could have strangled him while still unborn; QE joins in the condemnation of his actions. Richard has a flourish and alarum played to drown out the bitter women. His mother says his birth caused her great burden, his childhood was frightful, etc. She tells him she will never speak to him if he survives the upcoming war, and places a curse on him, praying for the success of the opposing army. Despite this hostile setting, Richard once again masterfully pursues his interest in QE's daughter Elizabeth with her mother. QE offers to disown her to protect her from him. Richard first tries to deny a part in slaying E4's sons, then argues that he loves the daughter. QE mocks how he could woo Elizabeth with his past history as it is, yet Richard argues that the children they would have would be a comfort to QE in her old age and would make up for the lost children of her own--and she would be mother to a king. He wants her to call Dorset home from France. He argues this would lead to peace in England and asks that she judge him on what he will be, not what he has been. She finally agrees to present Richard's suit to Elizabeth. To himself, Richard mocks her shallow changeability [just as he did Anne]. Ratcliffe informs Richard that Richmond is approaching England with a navy. Richard sends Catesby to the Duke of Norfolk and Ratcliffe to Salisbury, to enlist their support. He is in a state of confusion. Stanley informs him that Richmond is approaching at sea, supported by Dorset, Buckingham, and Morton, intending to claim the crown. Richard suspects that Stanley will betray him, and requires him to leave his son George Stanley behind, saying he will be beheaded if Stanley turns on him. More messengers arrive with news of further uprisings and rebellion against his rule. But Buckingham's army is scattered by floods. And word comes that Richmond had to return to France after a storm [historically 1483]. Catesby soon arrives to say Buckingham has been captured [historically 1485]. London, Stanley's home. Stanley sends word of his support for Richmond via a letter carried by Sir Christopher, but expresses fear for his son's life. Richmond is now in Wales, and his army makes its way toward London. Salisbury. The sheriff leads the captured Buckingham to his execution. He laments his fate and regrets the wrongs he has committed. Camp near Tamworth. Richmond, Oxford, Sir James Blunt, Sir Walter Herbert and others are pleased at the unimpeded progress of their march deep into England. Bosworth's Field. Richard is in arms with Norfolk, Ratcliffe, the Earl of Surrey, and others. They are somewhat battle weary and Lord of Surrey looks sad. Richard has his tent erected. Nearby, Richmond et al are also camped and he optimistically thinks about the upcoming battle. Stanley is nearby but holding back because of fear for his son's life. Richard asks Catesby to send word to Stanley to move closer or risk losing his son. Richard and his allies are dispirited--he calls for wine to cheer himself up. Stanley appears before Richmond and promises his support. Richmond prays to God for support in his just cause against the usurpers. As Richard and Richmond sleep, ghosts of his victims appear to Richard, all expressing support of Richmond: Young Prince Edward (son of H6); H6; Clarence; Rivers, Grey, and Vaughan; Hastings; the two sons of QE; Lady Anne; and finally Buckingham. Richard awakes in terror, regretting his hateful deeds. Ratcliffe arrives to help him into his armor and reassures him to not be afraid of shadows. Richard decides to go among the tents to eavesdrop on how the men think of him and see if any have turned away from him. In contrast, Richmond has slept well and peacefully. He gives his oration to the soldiers--they are fighting on the good and Godly side and he will fight to the death if necessary to win the battle. Richard is reassured that Northumberland believes Richmond is not trained well in arms. The sun has failed to rise at the expected time (or is obscured), a black omen to Richard. The sky seems to frown on his army, but Richard consoles himself it must appear the same to Richmond's troops. The foe is appearing in the field. Richard prepares for battle and rallies his leaders, appealing to might rather than to conscience, then gives his oration to his troops, disparaging the vagabond army attacking them. A messenger tells him that Stanley has gone over to Richmond. Richard wants George killed but Norfolk advises him there is no time. Same. Norfolk makes forays. Catesby encounters Richard, whose horse is slain. He valiantly refuses to withdraw and seeks Richmond on foot, crying "A horse! A horse! My kingdom for a horse!" Same. Richard and Richmond fight, Richard is slain. Richmond proclaims that Richard is dead. Stanley offers him the crown. George Stanley is still alive. Norfolk, Ferrers, Brackenbury, and Brandon have been killed. Richmond proclaims a pardon for all soldiers who will return to his rule. He has at last united the red (Lancastrian) and white (Yorkist) rose factions and liberated England from its long years of war. He will marry Elizabeth, daughter of E4, and gives one last prayer to God that peace may long live thereafter in England.